This examples shows you how to read and visualize force map data from the attached matrix sensor. You can find two connectors on Snowboard. One is for the Matrix Sensor 1610 and the other is for Matrix Sensor 1007. In this tutorial, we assume to use Matrix Sensor 1610. Connect the Matrix Sensor 1610 or 1007 to Snowboard. Snowboard is then connected to a PC. 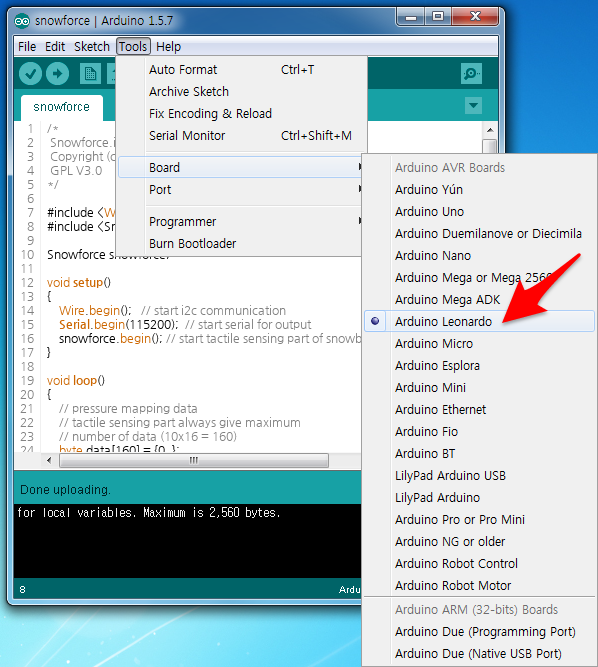 Snowboard 2 users need to choose their own Arduino in this step. 1. Go to the unzipped folder you create during the installation, find and double click snowforce.exe. The application will run, automatically find Snowboard, and visualize force map from the matrix sensor. If you are using the Matrix Sensor 1007, you need to replace the whole contents of surf.ini with those ini surf_10x7.ini. These ini files can be found in <extracted folder>/processing/snowforce/data. 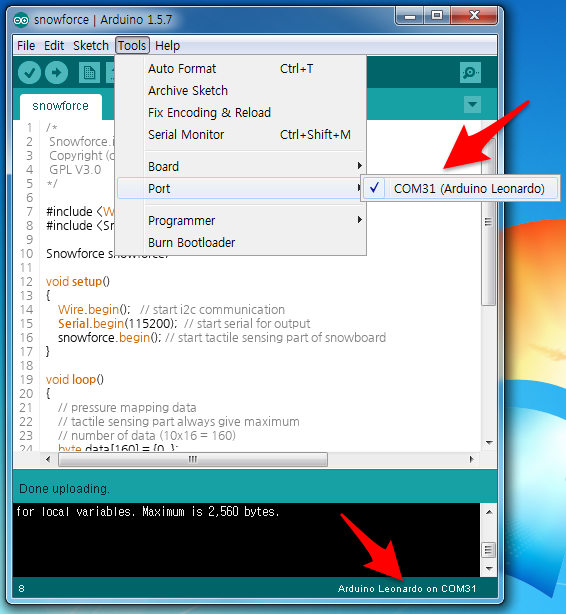 By default, the application assumes that the Snowboard is connected to the first COM port. 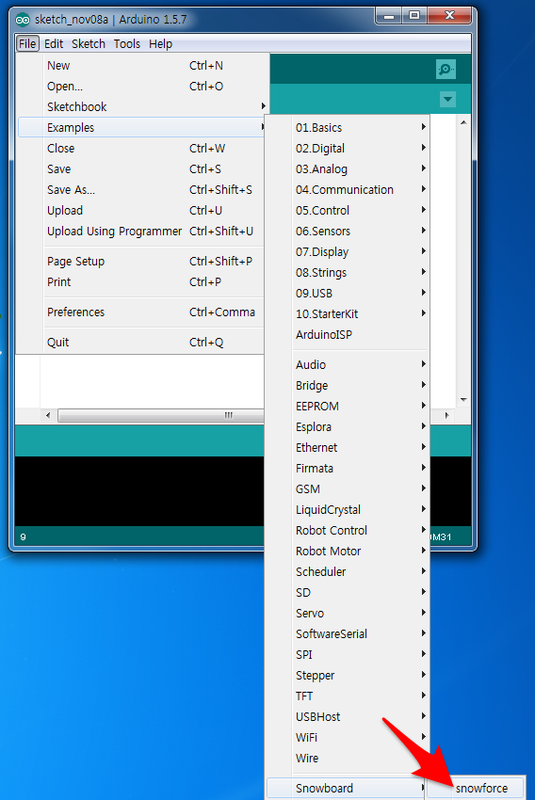 If there are several COM ports in your PC, the this application will not run correctly. In this case, open surf.ini and find the following line and change its value to an appropriate port number. For more detailed information about the visualization application, see Snowforce page. In the setup, you will tell Snowboard to start I2C and serial communication. I2C is for internal communication between Arduino component and force touch controller in Snowboard. By starting serial, your Snowboard is ready to send data from the touch controller to a PC. After that Snowboard will tell the controller to initialize itself. 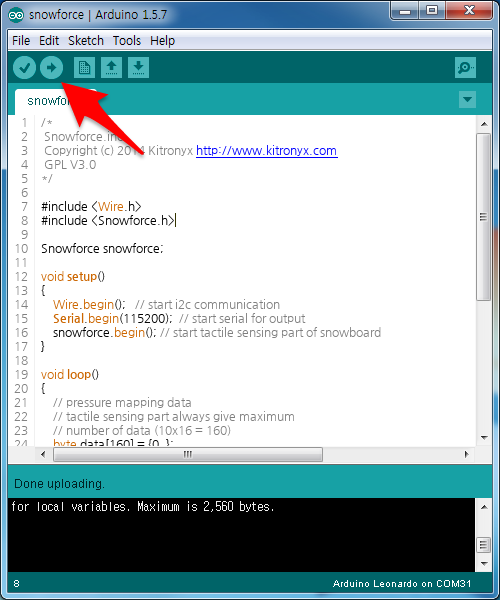 In the main loop, when Snowboard gets an arbitrary data from PC via serial it will read force data and send it to PC. Actually, only following two lines are required to get data from a matrix sensor. where (Di, Aj) indicates the crossing point of ith drive line and jth sense line on the matrix sensor. See Snowboard product page to know pin map.